I write this post with a little bit of worry in my stomach. I talked to Mom today, and she is in the hospital. Some of my long time readers may remember that she was diagnosed with breast cancer when she was forty, and remained cancer free for many, many years. About four years ago, she discovered that the cancer metastasized to her bones. There are spots all over her body, but until recently hormone treatments had controlled the cancer. Last November she underwent radiation treatments on her skull and brain to stop the worst of those spots from growing. This week, she had severe pain in her chest, and so she went to the ER. They found a broken rib, and the broken bone is right where a cancerous spot had formed. She is doing well, has a great attitude, and is determined to beat this thing!! 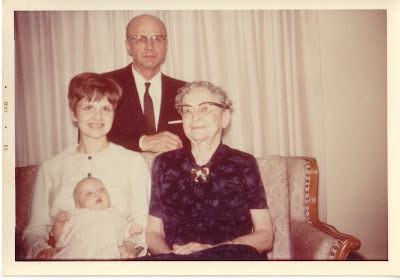 This picture, of four generations, shows me as a baby (in 1969, if you must know! ); my mom and great-grandmother are sitting on the couch with my grandfather behind them. This picture also shows four generations; my grandfather, me holding Lily, and my grandmother are sitting on the couch, with my mom behind us. My Grandpa could never get enough of Lily. He could have watched her play for hours. The love he had for his great-granddaughter in this picture is so clear.